Interactive Book: Are you Santa? 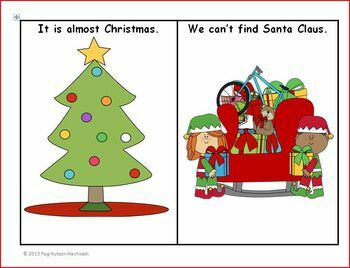 It is almost Christmas and the elves can’t find Santa Claus. As they look for Santa they find imposters but not the real Santa. Your students will enjoy the search for the real Santa and all the look-alikes that they encounter. Children love to put the picture images on each page as the story is read. The predictive sentences and picture cues allow for easy comprehension and sentence and question formulation when retelling. There are 18 pages in the story including 2 activity pages. All of the picture images are also provided. 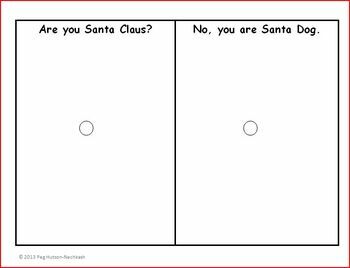 Are you Santa? tells the story of the search for Santa Claus. The elves find the following Santas as they search for the real one. Each page includes space for the images to be placed. On each page, the Santa picture goes on the left side of the page and the imposter Santa on the right. 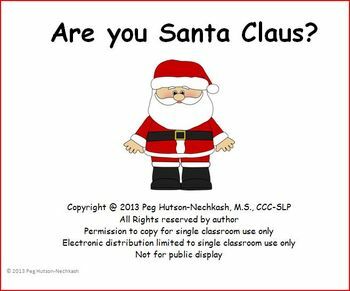 -Students can use “Are you Santa?” during independent, individual, small-group or large-group time. The story could even be sent home for additional practice. -Students are engaged as they follow the story and place images on pages. -Great for students with speech and language delays and disorders. The visual representation of the story helps with question formulation, sentence formulation, and story retelling. -Includes a "wh" question page to address additional IEP goals. -Easy assembly will provide years of learning and smiles. Please click on the star to “Follow Me” to receive notification of sales and new products as they become available.